Orange County Parks and Recreation held its groundbreaking ceremony for two new multi-purpose recreational fields and a splash pad at Barber Park on Friday, Feb. 1, 2019. Located in East Orange County between the Conway and South Semoran neighborhoods, the project is expected to be completed by fall 2019. Orange County Mayor Jerry L. Demings, Orlando Mayor Buddy Dyer and Orange County District 3 Mayra Uribe attended and provided remarks at the groundbreaking. Mayor Dyer echoed those sentiments and said the park expansion signifies an era of great partnership between Orange County and the City of Orlando. Established in 1997, Barber Park is an 81.5-acre community park that sits at the foot of Lake George. Orange County manages and operates the park, and owns more than 66 acres of site. The City of Orlando owns the 15 acres for the new multi-purpose fields and is leasing it to the County. 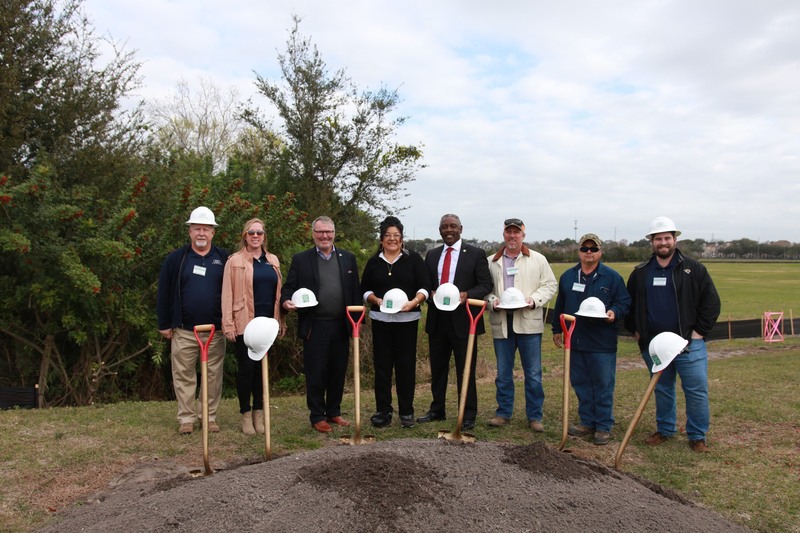 Nearby residents, including Parks and Recreation Advisory Board members and Orange County Public School Board Member Linda Kobert, joined the groundbreaking event to support the park-improvement project. Currently, Barber Park offers several sports amenities for basketball, volleyball, roller hockey and soccer. Additionally, the park features multiple picnic and rest areas, concrete walkways and a dog park. In addition to the two new fields and a splash pad, the project includes the construction of a sunning area, associated field lighting, additional parking and a storm-water pond with a large aquatic planting area. The $3.75 million project was funded by Orange County Government’s INVEST in Our Home for Life initiative and the Parks and Recreation Capital Improvement Funds. Orange County’s $300 million initiative INVEST in Our Home for Life launched in 2015 and includes a series of projects across Orange County that will provide long-term benefits to residents.